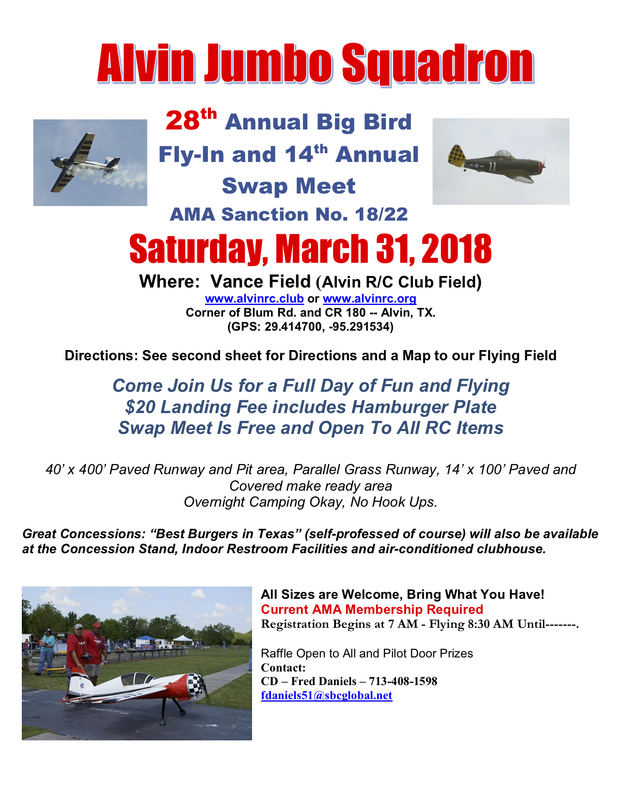 Our April meeting is on Saturday the 28th. 9:00 AM. Come meet and fly. 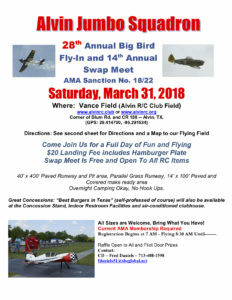 February Meeting is Saturday the 24th. Meeting starts at 9:00 AM. Come down and meet, greet and fly. That time again. The July membership meeting will be on Saturday the 28th. 9:00 AM. Come on down to meet and fly. Breakfast at 8:00 AM. This meeting will include nominations of officers and directors. Any one nominated must be given advance notice and should have agreed to serve. Don’t forget to come out October 14 to help with the Boy Scout event. Let’s help make sure they all get the merit badge. Yes, the field is dry and you can come out and fly. The clubhouse had 12″ of water and clean efforts are in process. The planes must fly to be eligible for prizes and judging will be by the registered pilots. Please note on the flyer some size restrictions will apply. Pilot prizes will be given away during the day and the pilot landing fee includes one hamburger plate. Raffle tickets may be purchased for chances to win some very nice prizes. Several prizes will be Raffled and will include a FMS Silver P-47 fighter PNP and an Aeroworks 50cc Yak 54 ARF QB. So come out and buy a “stretch” of tickets.